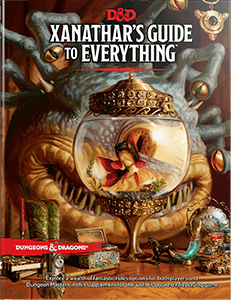 Xanathar’s Guide to Everything is a supplement for the epic fantasy Dungeons & Dragons, published by Wizards of the Coast. By November 2017, DnD players and DM’s alike were anxiously awaiting Xanathar’s Guide from Wizards of the Coast as this was promised to be the first real supplement for 5th Edition Dungeons and Dragons. Sure, there had been a few adventures that offered some small Player Character options, but this was going to be the big one, harking memories of the 3.5 supplements. Those of us that had been keeping up with Wizard’s play testing through their Unearthed Arcana were looking forward to seeing what character classes and choices had made it through the first cut. So the question remains, does it make the cut? Xanathar’s introduction notes that it’s intended to build upon the options already presented in the Player’s Handbook and Dungeon Master’s Guide. The book itself is broken into three general parts: Character Options, Dungeon Master’s Tools, and Spells. As I mentioned above, the character options get their flare from the playtesting that took place with Wizard’s of the Coast’s Unearthed Arcana. Our little weekly group recognized several of the classes from our playtesting and it was fun to see some of the options that made it through and those that didn’t. On average, each class received a few subclass options, with the rogue getting the most at four and the wizard only getting one. A couple of favorites among our group were the new Cleric domains, especially Forge; the Ancestral Guardian for the Barbarian, and the Hexblade for the Warlock. All providing ample role-playing and overall game play functionality. In addition, each class description provided additional options to help build your character’s backstory a little more. The racial feats at the end of the chapter provide some nice options to enhance your character. Chapter 2 provides new optional rules for gameplay. Many of these options were also tested through the Unearthed Arcana. Again, the book reminds you in this chapter that these options are just that, options, not rules. However, as a DM, I did appreciate the additional guidance that wasn’t present in the DM Guide, especially the tables upon tables of random encounters I can throw at my players. Oh, and did you want more info on magic items, such as fun minor items like a Dread Helm that makes your eyes glow red? Yeah, we’ve got those! Finally, the book ends with spells, oh glorious spells. This was a little disappointing as roughly half the spells had already been published in Princes of the Apocalypse, an early 5th edition campaign setting. Wizards and sorcerers make out like a bandit here…so many options. However, our poor clerics don’t get much love, only getting seven, two of which are cantrips. There are some really fun spells to play around with, like Temple of the Gods (a safe place to spend the night), Melf’s Minute Meteors (tiny flaming balls that explode), and everyone’s favorite, Mass Polymorph (think of the damage with a whole party of T-Rexes). All in all, Xanathar’s is a fun book and a great addition to the table. You can tell that the Wizards of the Coast’s team is putting a lot of thought and care into their releases, a change from 3.5 and 4th editions. Xanathar’s is well worth the wait and if the development team continues with this strategy, we could see this edition lasting for a long time. *Wait – did I mention the fun you can have by rolling for your character’s name at the end of the book….crazy fun!